A small plane made an emergency landing Wednesday at North Perry Airport in Pembroke Pines after the pilot reported a problem with the landing gear, officials said. 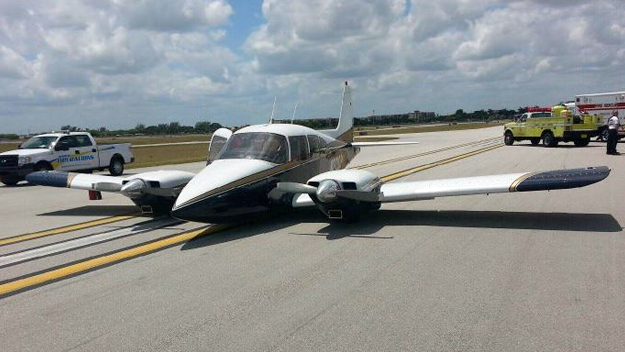 The pilot of a 1956 Piper PA-23 twin-propeller plane was forced to make a belly landing around 1 p.m. on one of the airport runways after the landing gear didn't deploy, said Broward County Aviation Department spokesman Greg Meyer. Pilot Herbert Reiskin, of Hollywood, was not injured, Meyer said. Reiskin keeps his plane in one of the hangars at the airport, Meyer said. "He experienced some problems with the landing gear. He flew around for a bit and then called it in," Meyer said. "It's a 1956 aircraft, it's an older aircraft." 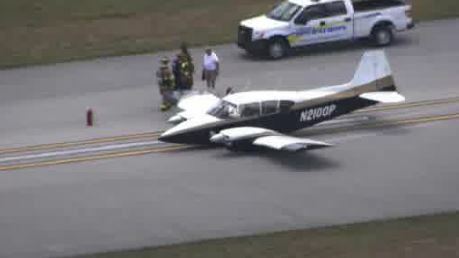 PEMBROKE PINES, Fla. (WSVN) -- A plane made a miraculous landing at North Perry Airport in Pembroke Pines, Wednesday. According to Pembroke Pines Fire Rescue, a Piper PA-23 twin-engine plane touched down without the help of its landing gear. Witnesses saw the aircraft with its belly scraping on the ground of the runway. Despite the frightening circumstances, the landing was successful. 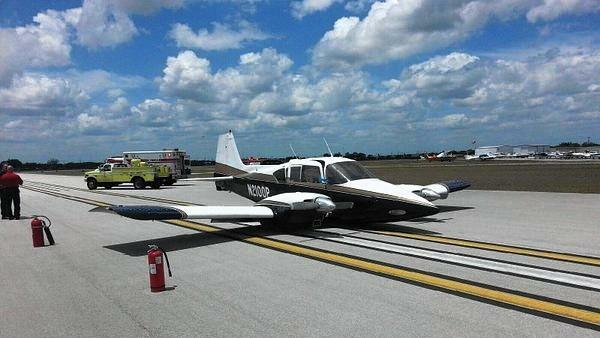 According to Pembroke Pines Fire Rescue there were no injuries and no fuel leak. Air Boudreaux will soon be back in service. 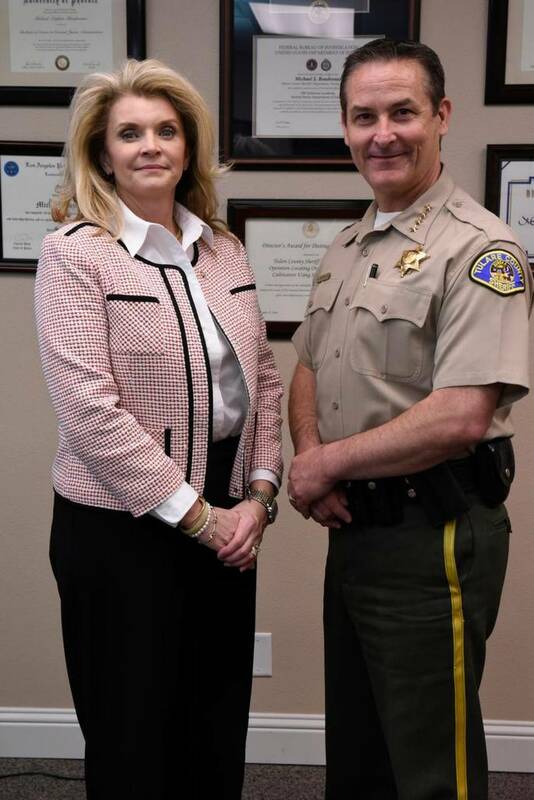 Tulare County Sheriff Mike Boudreaux welcomed five new employees to the Sheriff’s Department on Monday, including the new sheriff’s pilot, Michelle Simoes. She will fly the Sheriff’s airplane that will arrive in May. Simoes thanked Boudreaux for giving her the opportunity to get the department’s Aviation Unit back up and flying following the tragic plane crash of Sheriff One on Feb. 10. Killed in the crash were Sheriff’s Pilot James Chavez and Tactical Flight Officer Scott Ballantyne. Simoes said she knew Chavez well. In fact, he trained her to fly the two-seater light sport aircraft, the same airplane chosen first by the Tulare County Sheriff’s Office and later by the Kings County Sheriff’s Office. For Boudreaux, hiring Simoes helps the Sheriff’s Office heal by moving forward with the Aviation Program after losing Chavez and Ballantyne in the crash near Springville. Simoes’ role as a sheriff’s pilot is to support deputies on the ground. Communication is vital between the ground and the officers in the airplane. “I’m looking forward to supporting the Tulare County Sheriff’s Office and getting the new plane off the ground,” she said. The airplane provides another tool for law enforcement in an effort to keep the community safe. According to a press release, the “Eyes in the Sky” help deputies on the ground locate criminals and find lost children and at-risk adults, as well as patrol the county’s farmlands looking for criminals. Simoes, 48, was born and raised in Visalia. She lives in Tipton with her husband, They have a 23-year-old son. Before Simoes became a pilot, she helped run the family business and was a homemaker. Her desire to fly was sparked when her younger sister won a free introductory flight lesson. Simoes said she thought she would like to fly herself. Later, she found a flight instructor and began her own lessons while her son was in school in 2004. “I threw myself into my new passion,” she said. She obtained her private, commercial, instrument, multi-flight dispatcher and airline transportation pilot certifications. When Simoes had the opportunity to join the Kings County Sheriff’s Air Support Unit on a volunteer basis, she jumped at the chance. She helped start the aviation program there in early 2015 and was one of the pilots who flew the new plane to Hanford. Also sworn in on Monday were inmate programs specialist Elena Ledezma, emergency dispatcher Carlos Inacio, and correctional deputies Enrique Diaz and Kenrick Silvas. Airport officials will begin a two-year study of the Ronan airport after the Federal Aviation Administration funded a grant for the work. The $202,642 Aeronautical Survey and Airport Masterplan Update grant will be used to define whether the airport is in demand enough to expand it for use of larger firefighting aircraft that could potentially save lives. Lake County Joint Airport Board Chairman Rick Newman said that nothing will change in the Ronan area surrounding the airport. “No shovels will go into the ground in the next two years,” he said. The study is to determine if a need exists for bigger planes like those needed to fight wildland fires. Lake County is home to three airports, Newman said. Two of those airports are in areas that cannot handle larger aircraft. The St. Ignatius airport is not an FAA airport, he said. Polson is located in an area too close to a river, the lake, Tribal lands and other areas that inhibit expansion. Though Ronan is surrounded by its own set of special locations, designations and issues, it is an FAA site. Airport board leaders want to know if it is a location that is sought after, or capable of handling larger planes. Through the next two years, airport professionals will conduct things like a wind study to determine the prevailing wind direction, a traffic study to see how much activity the location receives, a farming study to see if expansion would impact area farmers, all things the FAA requires before allowing any kind of airport expansion. The FAA funds 90 percent of all member airports’ needs, Newman said. Additional individual airport funding is provided through rent of hangars and other outside sources. Other Montana cities that received FAA funding include Billings, Broadus, Circle, Forsyth, Hardin, Livingston, Malta, Shelby and Wolf Point. SPACEPORT AMERICA — Virgin Galactic’s pilot team on Wednesday performed the first operational tests of the company’s WhiteKnightTwo aircraft in New Mexico in almost two years. 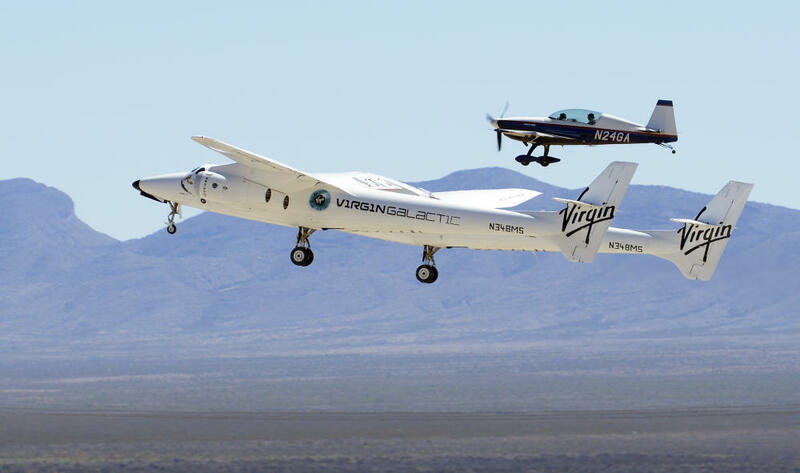 The dual fuselage WhiteKnightTwo — which will eventually carry SpaceShipTwo to high altitude before the vehicle drops and rockets to space — took off from Spaceport America after 9 a.m. for two hours of flight that allowed pilots and air traffic controllers at White Sands Missile Range and in Albuquerque to practice working together. Virgin Galactic brought six of its seven pilots to southern New Mexico this week for the operational tests, which began Monday and end Thursday. Chief Pilot Dave Mackay and pilot Kelly Latimer — Virgin Galactic’s newest hire to its flight team — flew the first WhiteKnightTwo exercises on Wednesday. WhiteKnightTwo corkscrewed up to nearly 50,000 feet and repeatedly glided back toward Spaceport, engines idle, only to graze the runway and take off again. Lead test pilot Mark “Forger” Stucky stayed on the ground to explain the day’s mission, which included tests that allowed the aircraft to simulate SpaceShipTwo’s descent. “The beautiful thing about WhiteKnightTwo is that it isn’t just a carrier aircraft that drops the spaceship, it can simulate the spaceship gliding and landing,” Stucky said. Working with air traffic controllers, too, “is a really important coordination exercise,” he said. An October 2014 accident during a rocket-powered test flight ripped apart the company’s spaceship and killed one pilot. Virgin Galactic has been recovering from that accident, rebuilding its spaceship and returning to its test flight program. Virgin Galactic rolled out a new SpaceShipTwo earlier this year and has begun ground testing, according to Mike Moses, senior vice president of operations. Flight testing could begin this summer, he said, and would be later followed by rocket-powered test flights. Some 700 “future astronauts” have put down payments for the $250,000 trips to the edge of space and back. Virgin Galactic says passengers will glimpse the curvature of the earth from space and feel a few minutes of weightlessness before SpaceShipTwo descends into earth’s atmosphere and glides back to Spaceport America. 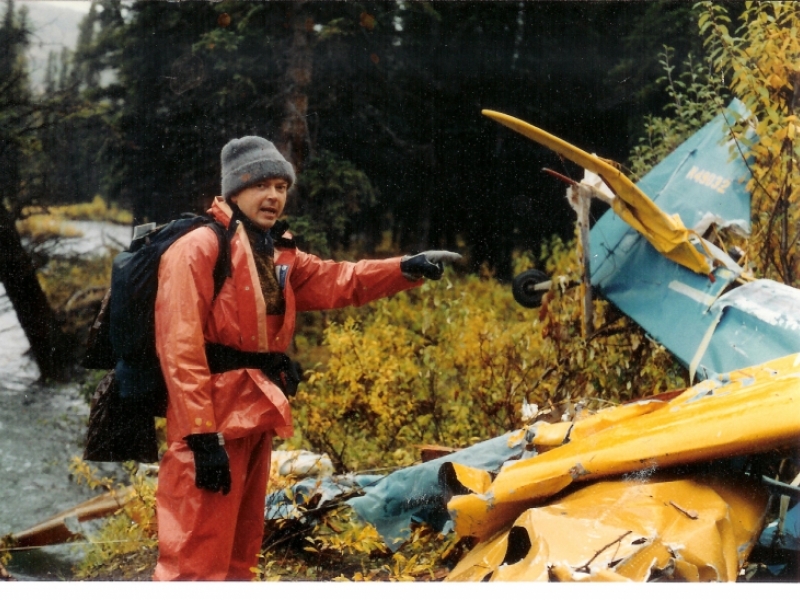 George Kobelnyk in his younger years as a National Transportation Safety Board air safety inspector at an unidentified crash site. On April 20, 2016, about 0900 Alaska daylight time, a Cessna 172 airplane, N63541, impacted birds in flight and then terrain about 2 miles southwest of Birchwood Airport (BCV), Chugiak, Alaska. The airline transport pilot and three passengers sustained fatal injuries. The airplane sustained substantial damage. The airplane was registered to the pilot and was being operated by 70 North LLC, Anchorage, Alaska, as a 14 Code of Federal Regulations Part 91 visual flight rules aerial photography flight. Visual meteorological conditions existed near the accident site at the time of the accident, and company flight-following procedures were in effect. The purpose of the flight was to conduct aerial surveying and photography over an area of land adjacent to the west edge of the airport property. A review of Federal Aviation Administration (FAA) air traffic radar data revealed that the airplane departed BCV about 0840 in a southerly direction before turning west and then conducted two 360° turns. The airplane then proceeded northeast of BCV for about 4 miles before turning toward the southwest, overflying the intended photography area and continuing past Beach Lake. The airplane then turned east for about 2 miles before the radar track terminated. The last radar point indicated that the airplane was about 800 ft mean sea level (msl) and 102 knots and traveling on about a 126° ground track. The pilot held an airline transport pilot certificate with airplane single-engine land, multiengine land, single-engine sea, helicopter, and instrument ratings. He also held a flight instructor certificate with airplane single-engine, airplane multiengine, helicopter, instrument airplane, and instrument helicopter ratings. His most recent FAA second-class medical certificate was issued on June 23, 2015, and with the limitation that he "must have available glasses for near vision. Not valid for any class after." The pilot's personal logbooks were not located. A review of company records revealed that, on a pilot history form dated April 19, 2016, the pilot indicated that his total flight experience was about 11,700 hours, 180 hours of which were in the previous 12 months. The airplane was manufactured in 1981. It was equipped with a Lycoming O-320 series engine. The last annual inspection was completed on June 2, 2015, at which time the airplane had 19,660 hours in service. The closest weather reporting facility was BCV, about 2 miles northeast of the accident site. At 0806, a BCV METAR reported, in part, wind calm; sky condition, overcast clouds at 8,000 ft; visibility 9 statute miles; temperature 39°F; dew point 30°F; and altimeter setting 30.04 inches of mercury. 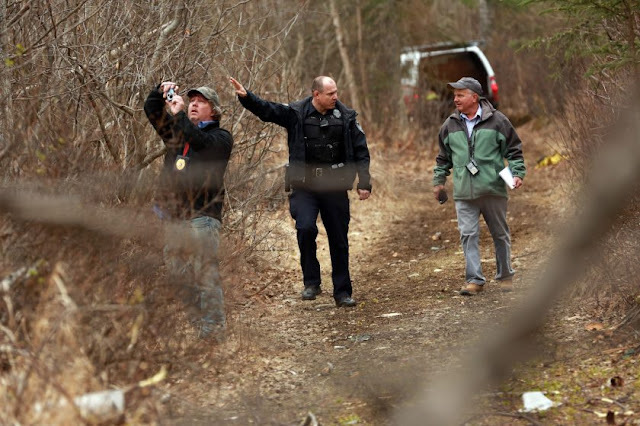 The wreckage was located in a forested area of densely populated spruce and birch trees with thick underbrush at an elevation of about 230 ft msl. The distance from the initial impact point of an estimated 100-ft-tall spruce tree to the final piece of debris was about 160 yards along a magnetic heading of about 275°. Following the impact, a postcrash fire ensued, which consumed the fuselage. Flight control continuity was established from the cockpit controls to all control surfaces. The left horizontal stabilizer exhibited leading-edge crushing upward and aft toward the front spar. The rudder remained attached to the vertical stabilizer at the middle and upper attachment points. The rudder was bent upward and to the right about 100° at the middle attachment point. Organic material was present on the left side of the fuselage, vertical stabilizer, horizontal stabilizer, rudder, and elevator. 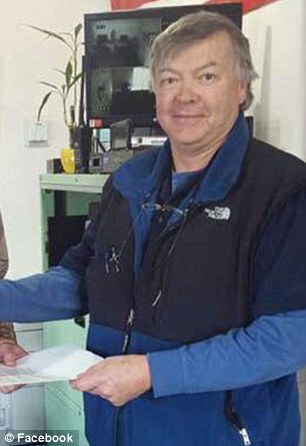 The Alaska State Medical Examiner, Anchorage, Alaska, conducted an autopsy of the pilot on April 21, 2016. The cause of death for the pilot was attributed to "multiple blunt force injuries." The FAA's Bioaeronautical Sciences Research Laboratory, Oklahoma City, Oklahoma, performed toxicology testing on specimens from the pilot. The testing was negative for ethanol, drugs, and carbon monoxide. A complete feather found near the first pieces of debris and samples of the organic material found along the left side of the fuselage, left horizontal stabilizer, vertical stabilizer, rudder, and elevator were sent to the Smithsonian National Museum of Natural History Feather Identification Lab, Washington, DC, for analysis. The complete feather perfectly matched a museum specimen of an immature, plumaged Bald Eagle. The organic material samples contained several microscopic feather barbs and barbules that were microscopically compared to all possible bird species in Alaska with similar feather structures. The samples matched the Bald Eagle in barbule length, pigmentation patterns, and node morphology. According to the US Department of Agriculture and the Smithsonian Institution, this is the first known and recorded Bald Eagle impact with an airplane in the United States that resulted in occupant fatalities. A follow-up examination of the engine and fuel system did not reveal any anomalies, contamination, or evidence of malfunction in any of the engine accessories. Examination of the cylinders, pistons, valve train, crankshaft, and other internal components revealed no evidence of an anomaly or malfunction that would have precluded normal operation. The magnetos remained secure at their respective mounting pad. The magnetos had sustained varying degrees of thermal damage that rendered the units inoperative; therefore, they could not be functionally tested. Magneto-to-engine timing could not be determined. Each of the magneto drives remained intact and undamaged. No evidence of impact with foreign objects was observed in the air passages and induction system of the carburetor and engine. At 9:08 a.m., just after police say the crash was first reported, smoke can be seen on the horizon. FAA weather camera photo. On April 20, 2016, about 0900 Alaska daylight time, a Cessna 172 airplane, N63541, sustained substantial damage after impacting tree-covered terrain about 2 miles southwest of the Birchwood Airport, Chugiak, Alaska. 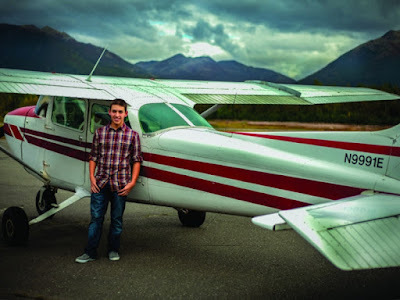 The airplane was registered to the pilot, and operated by 70 North LLC, Anchorage, Alaska, as a visual flight rules (VFR) aerial photography flight under the provisions of 14 Code of Federal Regulations (CFR) Part 91. The airline transport pilot and three passengers sustained fatal injuries. The flight departed from the Birchwood Airport about 0840. Visual meteorological conditions (VMC) prevailed at the time of the accident, and company flight following procedures were in effect for the local area flight. According to the operator's manager, the purpose of the flight was to do aerial surveying and photography over an area of land adjacent to the west edge of the airport property. The Birchwood Airport is located adjacent to the shoreline of the Knik Arm. 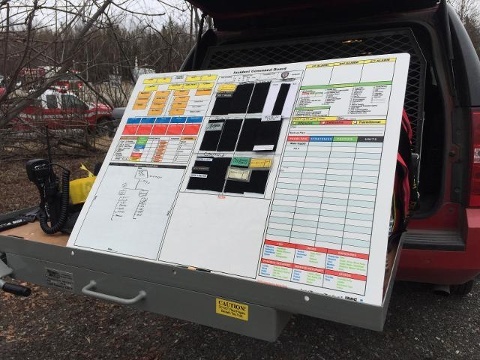 The National Transportation Safety Board (NTSB) investigator-in-charge (IIC), along with three Federal Aviation Administration (FAA) aviation safety inspectors, reached the accident site on the morning of April 20. The wreckage path was located in an area of dense spruce and birch trees with thick underbrush, at an elevation of about 230 feet mean sea level (msl). The main wreckage came to rest about 480 feet west of the spruce tree, and the debris path between the tree and the main wreckage site displayed signs of extensive fuselage fragmentation. Debris consisting of small pieces of plexiglas, aluminum, a door frame assembly, and various landing gear components were in the debris path. All of the airplane's major components were located at the main wreckage site. A postcrash fire incinerated a majority of the airplane's fuselage. A preliminary review of archived FAA air traffic control radar data revealed that the airplane departed from the Birchwood Airport and headed south for about 1.5 miles, then it turned west and completed a 360-degree turn at altitudes between about 1,500 to about 1,800 feet msl in an area less than a mile south of Beach Lake. The airplane then continued west toward the Knik Arm shoreline. Upon reaching the shoreline, the airplane completed a series of turning maneuvers at altitudes ranging between about 2,000 to about 2,400 feet msl before it proceeded northeast (generally along the Knik Arm shoreline), overflew the Birchwood Airport, and continued generally northeast for about 4 miles. 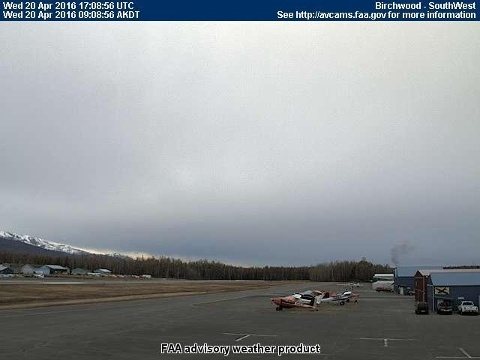 The airplane then turned southwest, again flew over the airport, and continued southwest and back to the same area along the Knik Arm shoreline where it had completed its previous turning maneuvers. From an altitude of about 1,300 feet msl, the airplane began a right turning maneuver during which it descended to about 900 feet msl before exiting the turn about 1,100 feet msl and proceeding to the southeast. The data track showed that the airplane proceeded southeast for about 1 mile at an altitude of about 1,100 feet msl before its last data position. The last position from the radar data indicated that the airplane was about 800 feet msl, with a ground speed of about 102 knots, and traveling on about a 126-degree track. The airplane was equipped with a Lycoming O-320 series engine. A detailed examination is pending. At 0806, an aviation routine weather report (METAR) from the Birchwood Airport, about 2 miles northeast of the accident site, reported, in part: Wind calm; sky condition overcast clouds at 8,000 feet; visibility 9 statute miles; temperature 39 degrees F, dew point 30 degrees F; altimeter, 30.04 inHg. ANCHORAGE, Alaska (AP) — A small airplane hit a bald eagle before it crashed just north of Anchorage, Alaska, last month, killing all four people on board. 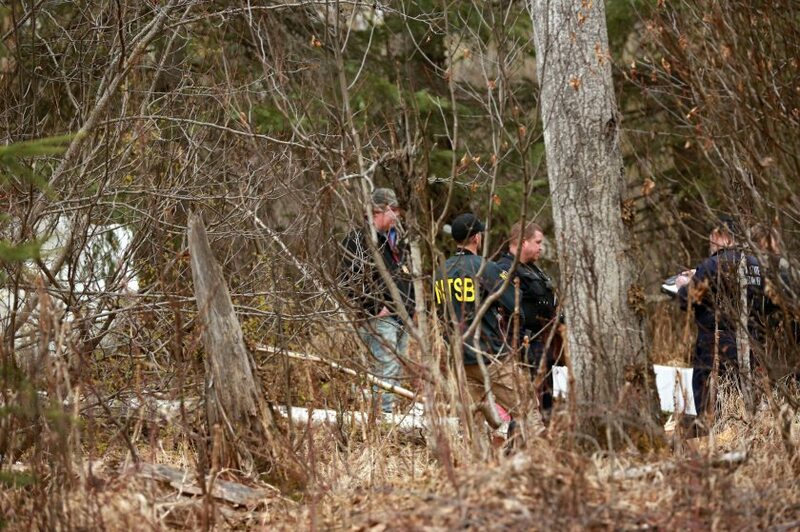 An investigator says it’s the nation’s first civilian plane crash to result in deaths after an impact with a bald eagle. Shaun Williams with the National Transportation Safety Board says there have been other crashes involving eagle strikes that resulted in serious injuries, not deaths. The pilot, co-pilot and two passengers died when the plane went down April 20 near a small airport about 20 miles north of Anchorage. Williams says an unknown substance was later found on the aircraft. Analysis at the Smithsonian Institution in Washington, D.C., determined some of it was feathers and other materials that came from an immature bald eagle. 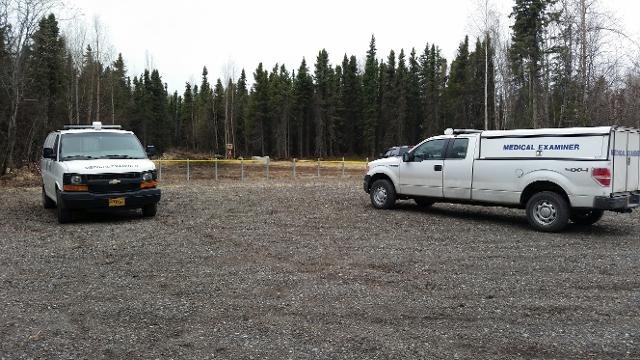 PALMER -- The small plane that crashed near Chugiak Wednesday morning, killing four people -- including the former National Transportation Safety Board investigator at the controls -- was headed for a nearby survey project in the area of Joint Base Elmendorf-Richardson. Pilot George Kobelnyk, 64; co-pilot Christian Bohrer, 20; and surveyors Kyle Braun, 27, and Sarah Glaves, 36, died in the crash of Kobelnyk’s Cessna 172P around 9 a.m., shortly after taking off from the Birchwood Airport. Braun and Glaves both worked for TerraSond, a ground and ocean surveyor headquartered in an industrial area on the south side of Palmer. 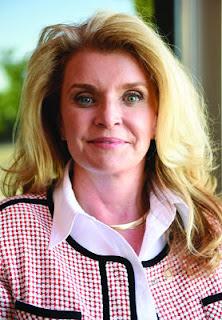 The firm has 55 employees and offices in Seattle, Texas and Mexico. The pair was on the first day of a survey next to JBER, not far from the airport where they took off, Schillinger said. Federal investigators finished their on-scene work by noon Thursday and removed the wreckage scattered over a 100-yard debris field west of Beach Lake Road near Chugiak, according to NTSB investigator Shaun Williams. The wreckage was taken to a secure facility in the Valley where it will be examined. The investigation into the crash is still in its infancy. Williams said he expected a preliminary report to be released next week, but the more comprehensive factual report and ensuing probable cause finding are still 12 or 13 months away. One witness to the plane's takeoff has spoken with the Federal Aviation Administration, but Williams said he had yet to interview them. 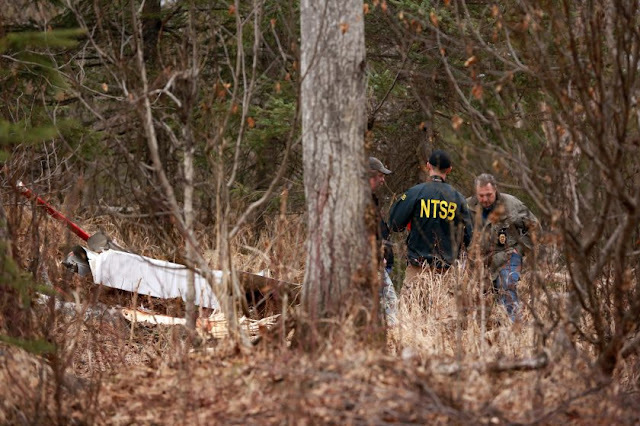 Investigating a fatal crash involving a former NTSB investigator is no different than any other aviation incident in which someone dies, he said. "All accidents with fatalities are difficult," he said. "Every victim, it's somebody a family is missing ... We have to think of that at all times. Everybody is hurting." Braun, 27, grew up in Butte and loved outdoor activities and photography. He was caring for his mother after his father’s death last year. He worked as a drafter for TerraSond. Glaves, 36, has family on the Kenai Peninsula and was an avid painter and musician. She played flute in Mat-Su Concert Band, where she was a steady but fun-loving musician talented enough to participate in a small ensemble. State Sen. Peter Micciche, who represents Soldotna, met Glaves when they took a class together at Kenai Peninsula College. He called her a “brilliant young woman” who helped put together a trio and surfaced at many musical gatherings. “Pretty much everything Sarah did made the world a better place,” Micciche said. TerraSond’s Palmer offices were somber on Thursday. Employees were still trying to deal with the sudden loss of Braun and Glaves. “Both of them really are irreplaceable,” Schillinger said. Kobelnyk, a veteran NTSB investigator, left that agency in the 1990s to serve as a senior manager with the Federal Aviation Administration. He remained a highly certificated pilot who flew daily, family members said. Bohrer was a Chugiak native and avid aviator who played high school baseball and loved to take pictures from his plane. A junior majoring in mathematics at the University of Alaska Anchorage, Bohrer was a member of the Seawolf Debate Team and made it to the final round of the March competition. 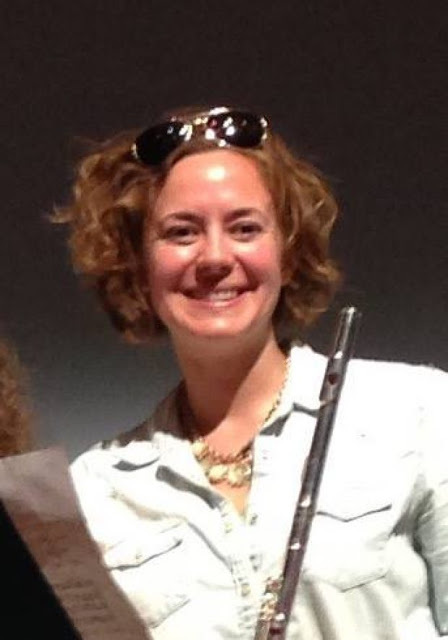 Zaz Hollander serves on the board of directors for the Mat-Su Concert Band, where Sarah Glaves was also a member. 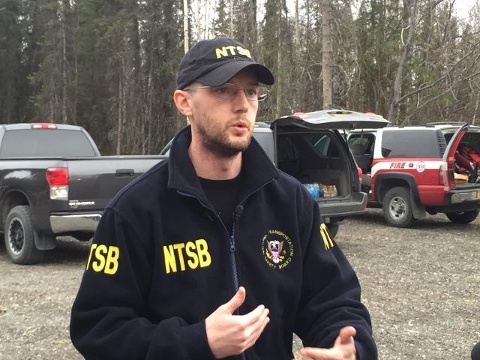 The pilot of a small plane that crashed near Chugiak Wednesday morning with four aboard was a former National Transportation Safety Board investigator with extensive aviation experience in Alaska. 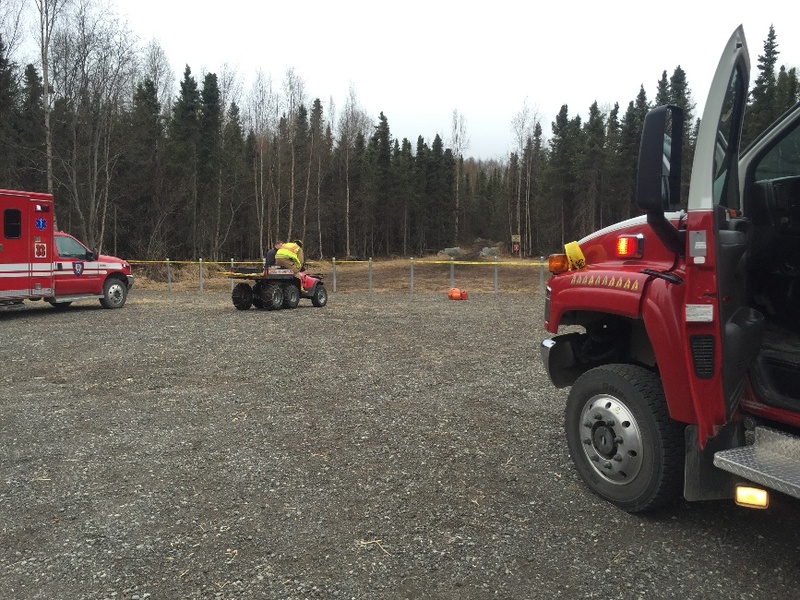 Anchorage Fire Department Chief Dennis LeBlanc said the crash, off Beach Lake Road, was reported shortly after 9 a.m. There were no survivors. 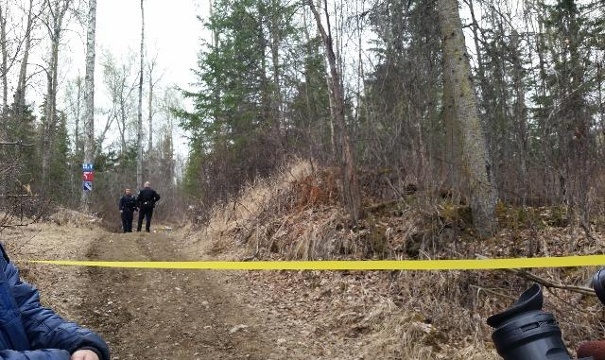 Anchorage police identified the victims of the crash Wednesday afternoon as pilot George Kobelnyk, 54, and co-pilot Christian Bohrer, 20. The two passengers were Sarah Glaves, 36, and Kyle Braun, 27. The aircraft was registered to Kobelnyk, based on a tail number provided by National Transportation Safety Board investigator Shaun Williams. 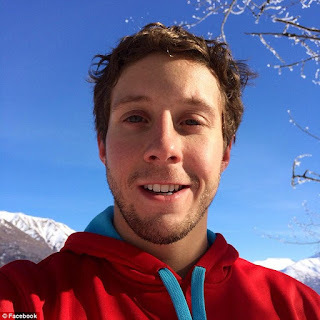 Kobelnyk had worked for both the NTSB and the Federal Aviation Administration in Alaska, according to his wife. FAA spokesperson Allen Kenitzer said the plane crashed under "unknown circumstances." Williams said at a 3 p.m. news conference that the debris field spanned about 100 yards. 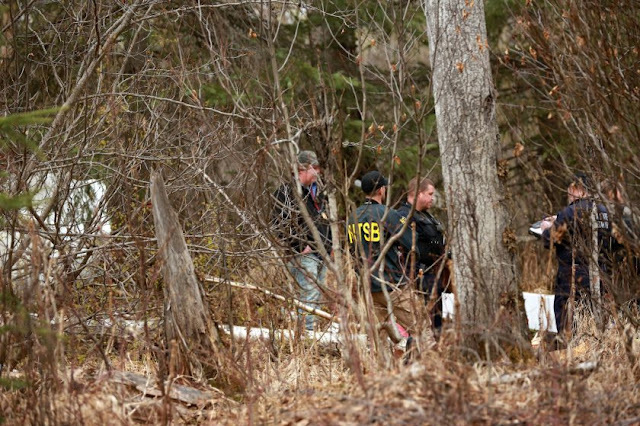 The plane was in pieces in a densely-wooded area of birch and spruce trees. It had taken off from the Birchwood Airport. He said one witness had watched the plane take off, but Williams had not yet spoken with that person. The plane crashed a few miles south of the airport around 9:05 a.m. with four people onboard, Williams said. "The airplane fragmented upon impact with some of the trees," he said. "We'll know more once we start moving the wreckage." Chugiak Volunteer Fire and Rescue Chief Clifton Dalton said he received word of a plane crash at 9:07 a.m., when a citizen reported hearing the crash and seeing a plume of black smoke. Deborah Schaffer, a volunteer staying in an RV space at Birchwood Camp not far from the crash site, said she didn’t see the plane go down, but heard it. Schaffer said she heard a plane fly “really low” overhead despite nearby power lines, and then heard the plane sputter, followed by a loud thud. She pulled on shoes and a jacket and ran outside. 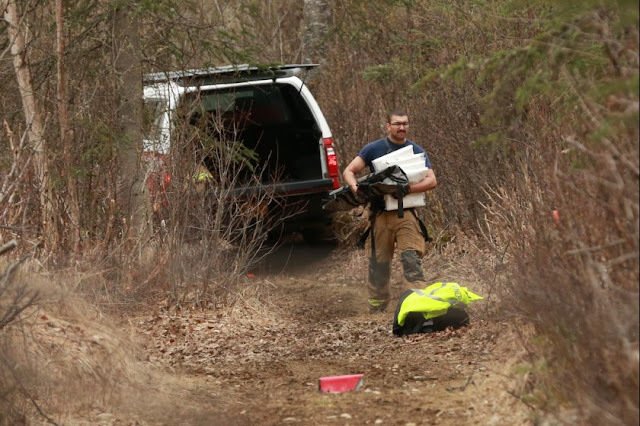 Dalton said firefighters drove on two four-wheelers roughly a half-mile down mushing trails in the area before discovering the scene: a fiery plane crash in a thickly forested area west of Beach Lake Road. Virginia McMichael of Chugiak Volunteer Fire and Rescue said shortly after the crash that firefighters had to hike and use ATVs to reach the site. McMichael said the plane had ignited a brush fire, but crews were dealing with it. Nine units were at the scene shortly after the crash, she said. Firefighters had the flames under control in 10 or 15 minutes, Dalton said..
"We were fortunate it wasn't a super dry day," he said. He said the plane was "destroyed" and there were no signs of survivors. The fire could make the investigation more difficult, Williams said. "Following the impact there was a post-crash fire and that takes away a lot of our evidence," Williams said. "So we have to go back to what we do have and work from there." By 1:30 p.m., The bodies of four adults were recovered from the scene, according to Dalton. 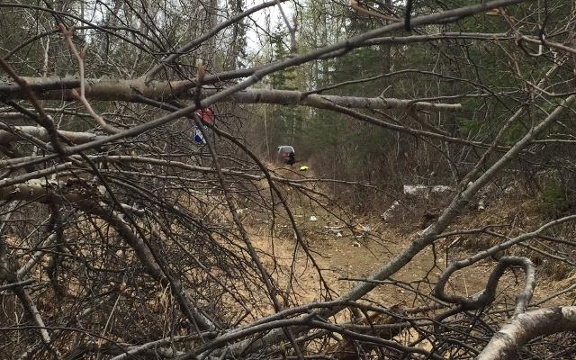 They were carried out from the crash site along muddy trails on the back of a four-wheeler. George Kobelnyk’s wife, Susan Kobelnyk, said her husband was "a very experienced aviator" who flew daily. He previously worked for NTSB and the FAA, she said. “Otherwise, he’s just a guy who loved his family,” Susan Kobelnyk said. George Kobelnyk served as the president of the Mustang Hockey Association in the early to mid-1990s, said acquaintance Chuck Homan. Kobelnyk volunteered his time to coach and referee youth hockey teams, Homan said. “He was very dedicated to the association,” he said. 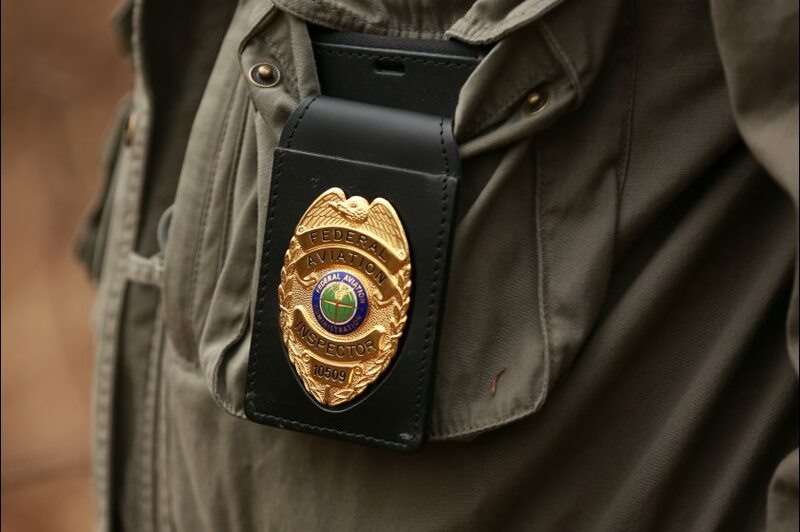 Current NTSB Alaska region chief Clint Johnson, who started with the agency in 1998, said he actually took Kobelnyk's place at the Alaska office. Kobelnyk had left a few years earlier to work as a senior manager for the FAA. Kobelnyk is listed as the only contact for Alaska Aviation Adventures on the company website. The company provides mountain flying and flight instruction, flightseeing and other services, according to its website. Kobelnyk held multiple certifications, including as a flight instructor and transport pilot, according to a federal pilot registration database. He also held multi-engine airline and helicopter certifications. "He did everything," Susan Kobelnyk said. "He could do it all." Many questions about the crash remained unanswered by Wednesday afternoon. Williams said he did not have information on where the plane was headed or what caused it to crash. Williams said the plan was to return Thursday to recover the wreckage and transfer it to a storage location for further investigation. He said representatives from Cessna Aircraft Company and Lycoming Engines would assist with the investigation. "No two airplanes come apart the same way. So that's a challenge. We have to sit there and go through every single piece, look at every break, every bend in the metal to determine exactly what caused this unfortunate event," he said. Authorities are recovering the bodies of those killed in a Wednesday morning plane crash near Birchwood, with aviation investigators on scene. 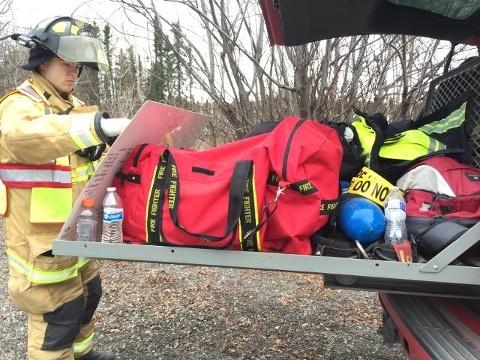 The crash was reported just after 9 a.m. in a densely wooded area, off of mushing trails in the Birchwood, Chugiak area, said Chugiak Volunteer Fire and Rescue Chief Clifton Dalton. 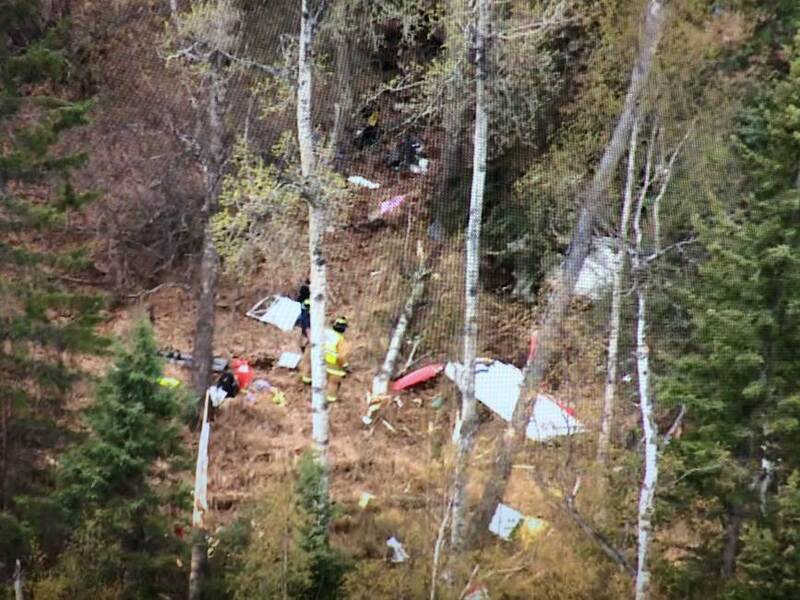 FAA spokesman Allen Kenitzer told KTUU the plane was a Cessna 172 with four people on board. He said that information was based on reports from local authorities. Dalton declined to talk about the number of deceased, citing the ongoing effort to notify next of kin. There are no signs of survivors, he said. The general area, Beach Lake Road, is about 20 miles northwest of Anchorage. The fire was quickly extinguished and did not significantly burn the surrounding area, Dalton said. 11 A.M. UPDATE: The chief of a volunteer fire department that drove ATVs to reach the remote site of a fiery plane crash today near Birchwood said there is no reason to believe anyone survived the crash. The cause of the crash, reported just after 9 a.m. near dog mushing trails off of Beach Lake Road, is unknown. The chief of the Anchorage Fire Department had said initial reports made to emergency dispatchers were of four dead. 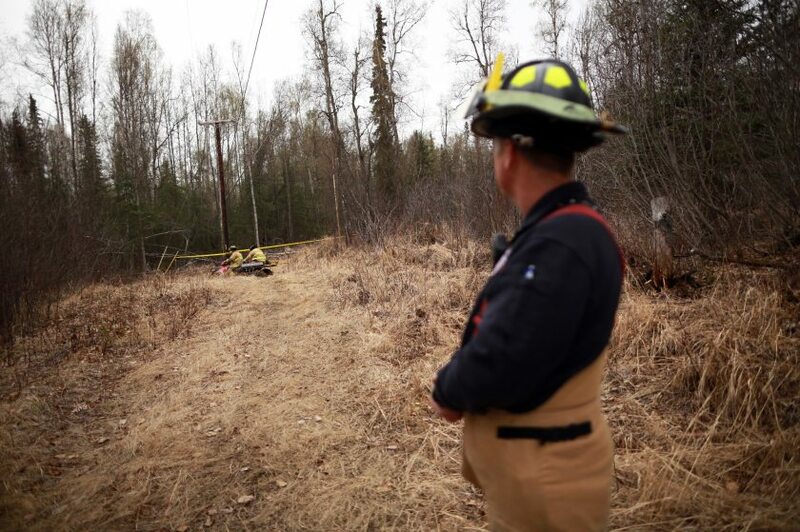 However, Chugiak Volunteer Fire and Rescue Chief Clifton Dalton, interviewed near the site of the crash, said the number of fatalities was not immediately known to rescuers on the scene. Beach Lake Road is about 20 miles northwest of Anchorage. The fire has been extinguished and did not significantly burn the surrounding area, Dalton said. Dalton said firefighters have not identified anyone involved in the crash. A National Transportation Safety Board investigator is on the scene. That agency is attempting to identify the tail number of the plane. 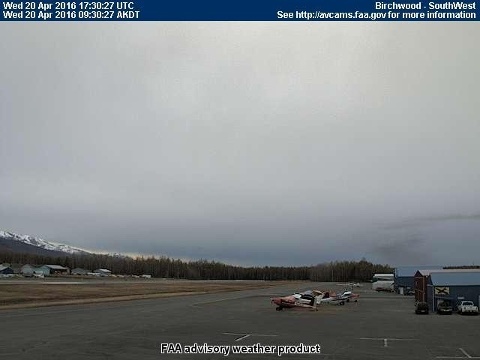 An automated weather update from Birchwood Airport at 9:50 a.m. describes calm winds in the area and an overcast sky with cloud cover at 8,000 feet. 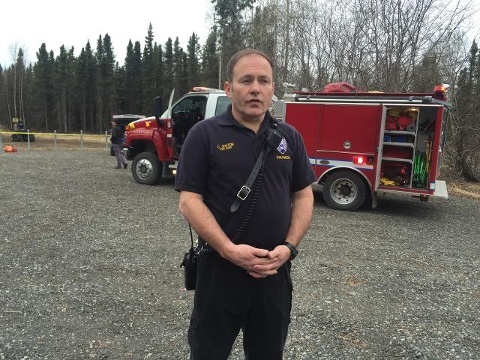 UPDATE: Anchorage Fire Department Chief Denis LeBlanc said initial reports from the scene of the crash indicate "that there were four fatalities." LeBlanc said that information is based on reports to dispatchers from the site of the fiery crash near Beach Lake Road, north of Anchorage. "The plane was reported to be fully engulfed," LeBlanc said. 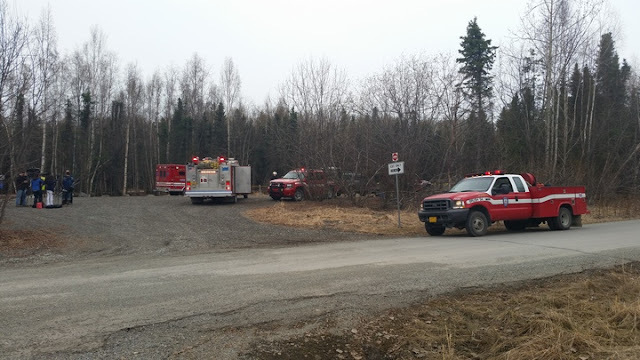 The Chugiak volunteer fire department is responding with seven units. Police spokeswoman Jennifer Castro said the crash was first reported at about 9:05 a.m. Smoke was seen in the area, leading to the firefighter response. 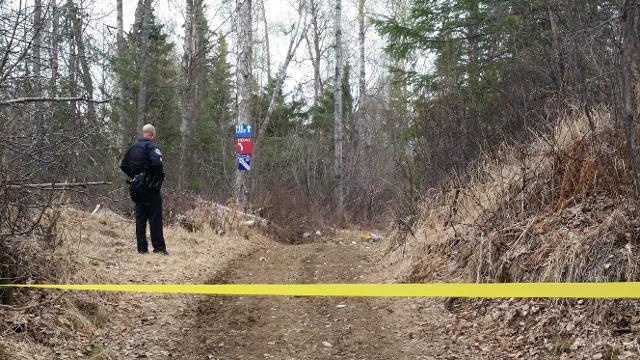 ORIGINAL POST: Anchorage police say they are responding to a plane crash this morning near Beach Lake Road. Firefighters and the National Transportation Safety Board is also investigating. Please avoid the area. 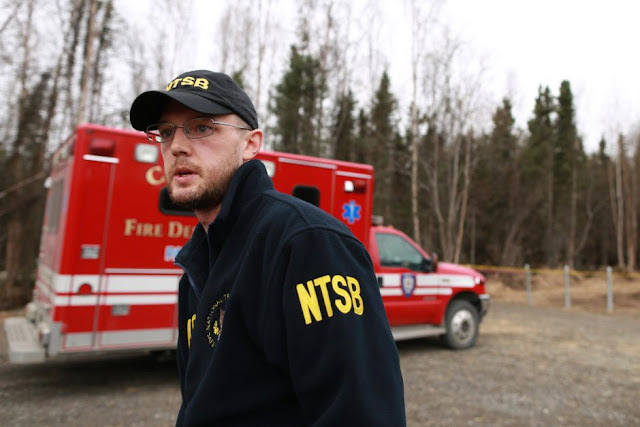 Shaun Williams of National Transportation Safety Board arrives to investigate a fatal airplane crash Wednesday morning, April 20, 2016, off Beach Lake Road near Chugiak. Chugiak Volunteer Fire Chief Clifton Dalton. 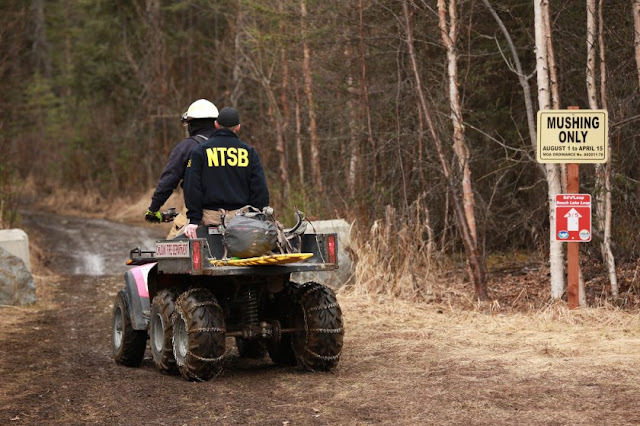 National Transportation Safety Board investigator Shaun Williams speaks at the scene of a fatal plane crash near Chugiak, Alaska on April 20, 2016. Mud dripping from a 4-wheeler that went to the aircraft crash scene. 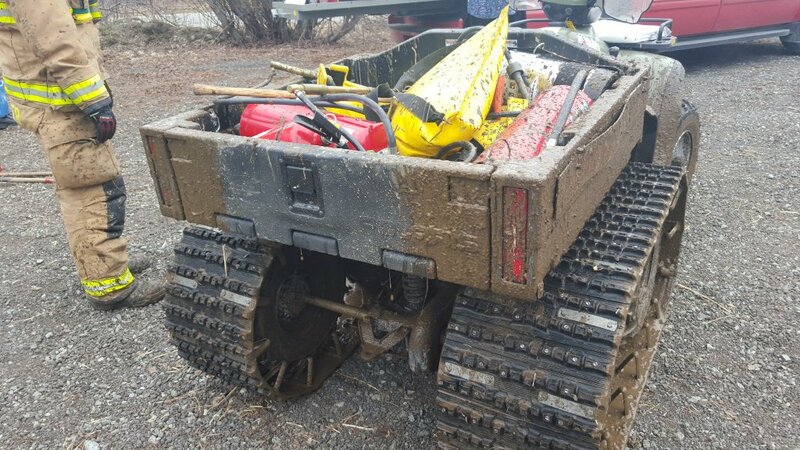 Firefighters say trail conditions are rough. CHUGIAK – At least four people are dead in a Chugiak plane crash, Anchorage Fire Department chief Denis LeBlanc said after talking to officials on scene. 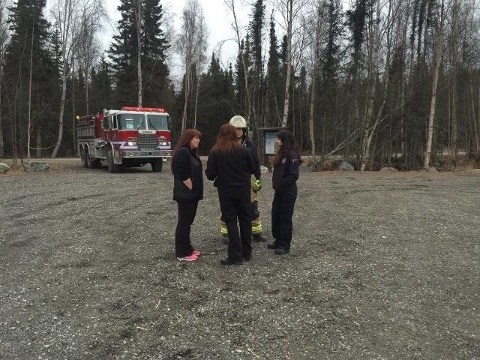 According to LaBlanc, the Chugiak Fire Department responded to the crash, near Beach Lake Road by the Birchwood Airport, with seven emergency response apparatuses and had not requested the service of Anchorage fire officials. 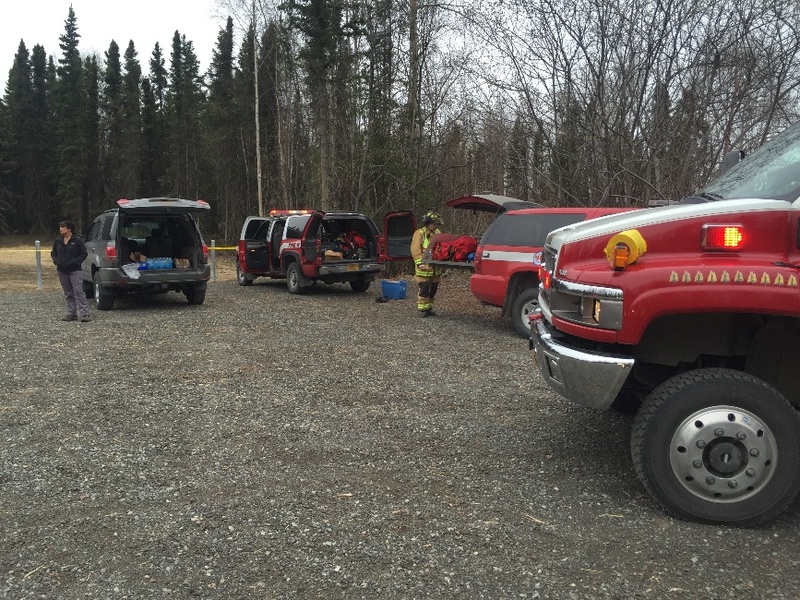 The crash occurred in a heavily wooded area and the plane was fully engulfed in flames, according to Chugiak Fire Department chief Cliffton Dalton. Chugiak firefighters were able to contain the blaze and prevented it from spreading, he added. 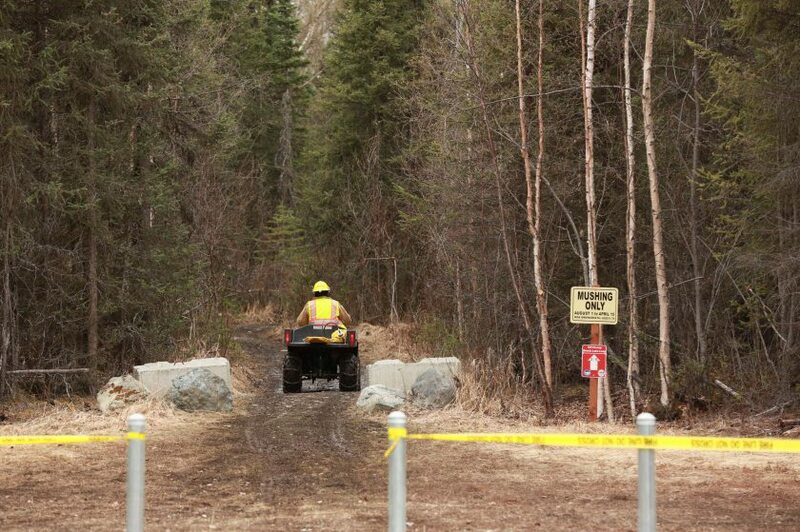 Emergency responders could only access the scene by four-wheeler. The crash site is not accessible by road. The Anchorage Police Department and National Transportation Safety Board (NTSB) were also responding, police said. An NTSB investigator arrived at the scene shortly before 10:30 a.m.